From the suburbs of Chicago, the midwest capital of blues, comes Vonassi, a promising young progressive rock band, releasing their debut work, The Battle of Ego, on ProgRock Records. Honestly, this is a fine album throughout. Possibly the foremost characteristic is Vonassi's efficient use of complexity in their compositions. Excepting the last song Coiled, all the songs time at less than five minutes, most around four. However, the textures Vonassi pumps into those short periods is quite remarkable. While songs can alternate between heaviness (The Drudge) and melodic subtlety (Posing for the Cold), they are deep with impressive bass lines, eccentric rhythms, provocative drumming, and graceful, less ostentatious, fret work. Many of these arrangements are made more clever and evocative from Vonassi's use of ambient to progressive keyboard work. Check the credit and you will find all members, Jeff Vaughn, Vince Buonassi, and Chase Carter, contribute with multi-instrumental proficiency. Another remarkable feature of The Battle of Ego include the intelligent lyrics that often show some insightful, and biting, culture commentary as on Strong Arm Welfare or The Now Game. Finally, returning to the over 'sound' of this work, while progressive maybe the overarching motif here, there is plenty of natural accessibility here, almost with an alternative rock feel. Open Hands, In the Mirror, and Beginnings echo that independent alt spirit and should attract the young modern rock listener. Overall, Vonassi's The Battle of Ego is singular and distinctive work demonstrating this trio's immense talent and creativity for melodic progressive rock with an modern alt rock feel. Highly recommended! 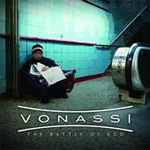 Vonassi's The Battle of Ego is singular and distinctive work demonstrating this trio's immense talent and creativity for melodic progressive rock with an modern alt rock feel. Highly recommended!